Here in the wild Westerlies, salt spray, random droughts and frosts of South Westland, to grow any kind of edible tree crop is an achievement. And yet with persistence over 20 years I have coaxed a wide variety of fruit out of this nature-blasted land. But often the fruits produced are small compared to the size that North Islanders or Australians are used to! Here is a picture of a bowl of exquisite, deeply flavoured fruit, fresh from the trees at the onset of winter, as trees begin to fruit following the end of the apples and pears. 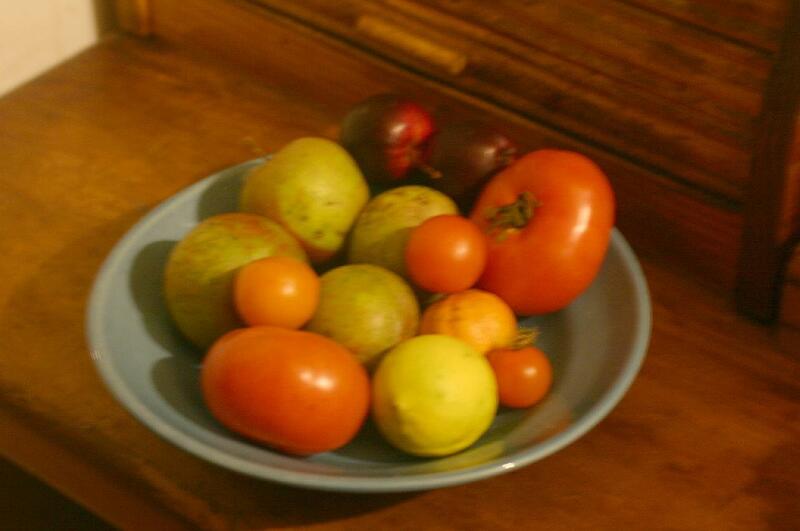 Here we have a Chinotto orange; a Hawaiian Lime; crab apples and late small Sturmer apples; and the last Beefsteak tomatoes from the tunnel house. All of these tiny fruit would fail to make the top three at the A and P show I am sure - but they are all appreciated here in the kitchen, and all organic and with great flavour. Sometimes small is beautiful as they say, and to get even one Italian liqueur orange growing in this climate is a miracle enough to make you gasp, as the sleet lashes day after autumn day on my iron-roofed cottage. The challenge now becomes: how to grow a bushel of the things for the still?